Whatever your worship "style," it takes a lot of work to make sure that our worship services are consistently engaging and life-giving. We are planning two retreats this summer (one new, one time-tested) that can help pastors and church leaders lay the groundwork for great worship this fall and winter. And of course, if we're honest, there are times when we enter the pulpit by the seat of our pants, because the other demands of ministry left us without enough time to prepare for worship. In either case, we trust that Holy Spirit is at work in our worship services. We know that God speaks through and in spite of us. Planning worship months in advance may not feel particularly Spirit-led, but doing long-range worship planning really is a spirit-led process. In co-leading the Creative Worship Design Retreat, Rev. Alan Jones often says, "I love a Holy Spirit that works 6 months in advance." He and Rev. Kari Jones describe in the retreat how their long-range planning of worship themes and scriptures gives them time to work with a team to plan creative and engaging worship. Of course, sometimes things will come up and worship plans will need to change. That being said, I never cease to be amazed at how lectionary texts and sermon series planned months in advance can match up so perfectly with current events or needs that pop up in the community. Advance worship planning sets the stage for the Holy Spirit to work as we meditate on scripture, plan sermons, choose songs, and prepare other creative elements of worship. It also means that when all of our other ministry responsibilities pile up, we know we have a plan for worship. It takes the pressure off a little, so that we can focus on the pieces that need our attention most. 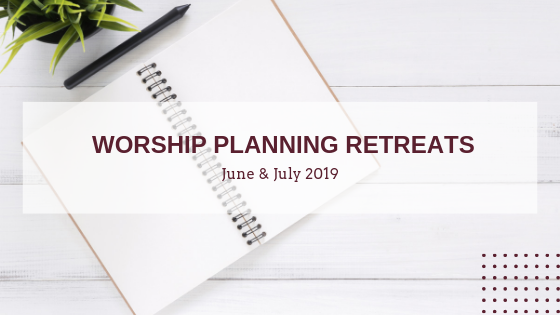 I know how much work goes into worship planning and sermon preparation, which is why Pecometh is offering two worship planning retreats this summer. Whether you've never planned worship more than a week or two out before, or you've been taking sermon planning retreats for years, I think you'll find something of value here. The Dunkle Mackey Sermon-Planning Retreat is a retreat for pastors, sponsored by the Dunkle Mackey Preaching Seminar. It takes place June 27 - 28, 2019 (Thursday - Friday). This overnight retreat will provide time for clergy to focus on long-range sermon planning. Rev. Dean Snyder will be the keynote speaker. The Creative Worship Design Retreat is designed for pastors and worship teams. If you don't have a worship team, it's a great opportunity to invite church members to help plan worship. It takes place July 12 - 13, 2019 (Friday night - Saturday). If you are ready to take your worship service to a new level, come learn some ways to design compelling worship with an impact. Whether or not you come to one of our retreats, planning worship themes a few months (or even a year) at a time will bless your team and your congregation. What works for you? What are your best worship-planning tips?